These Free, Printable Caillou Coloring Pages Are The Perfect Addition To Your Caillou Birthday Party Ideas. Find lots of Caillou character color pages to print out so you can color the day away...or color at the party away! You can also print out some extra pages to put into goodie bags and use as party favors. Use these fun coloring pages of Caillou to entertain your kids on a rainy day or as a kids birthday party activity. You can even put some into a goodie bag with some crayons as a party favor. 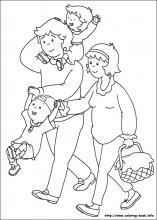 If your kids are Caillou fans they will enjoy these coloring sheets...and they are free so print out as many as you need. You can find more fun Caillou games, party supplies and party ideas at our Caillou Birthday Party Page. Here Are Your Coloring Pages! Go ahead...take a look at these fun pictures of the Caillou characters and print the ones you...and your kids...like the best!